This recording is the result of a very special project. 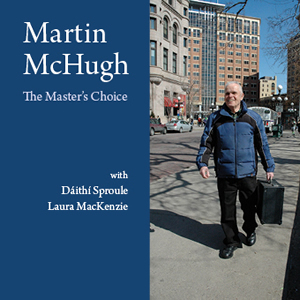 Not only was Martin McHugh my original mentor in Irish music, but he has also, as Liz Carroll states, “influenced an entire generation in Minnesota”. 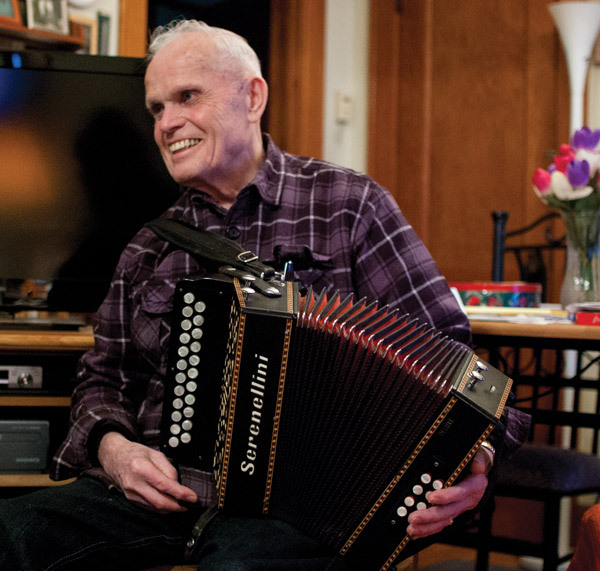 Martin’s musical gifts to the Midwestern Irish music scene have been significant – spanning decades and continuing today. In current times, players of Irish music are often lauded for playing louder, faster or fancier than the player next to them, and so many are learning the music off the internet, off CDs and out of books, with fewer and fewer players fortunate enough to learn by oral tradition. This seems an important time to pay tribute to a genuine and beloved traditional musician—a time to bring his music, style and story to the attention of today’s players and lovers of Irish music, both young and old. When I approached Marty with the idea of this recording project, I was delighted with his positive and thoughtful response. And when he agreed to the plan of selecting all the tunes, even allowing me to title it “The Master’s Choice”, I was thrilled. Our afternoons putting together the sets at Marty’s house, with our good friend and master guitarist Dáithí Sproule, were filled with as many stories and great bursts of laughter as there were tunes! Martin’s music is sweetly complex, filled with subtle melodeon-style embellishments and bold rhythms, all held within what are often unusual settings of tunes. Working with Marty on this project, I discovered how deeply he has thought about the music. Being a benevolent person of great humility, Martin does not typically disclose this depth in his musicianship while in general company. All the more reason for this salute! Listen to the reels on Track 4 for the sparkle of joyous conviction, and the jigs on Track 3 for the selection of some beautifully unusual notes. Enjoy Tracks 6 and 12 for their hearty, moving performances of a slow air and waltzes. Track 7 is a particular favorite of mine, as “The Pride of Petravore” (also known as “The Fair of Ballintuber”) was the theme tune of The Northern Star Céilí Band (originally The Plough and Stars Céilí Band) which we formed around Martin in 1976, steaming up dance halls across the Upper Midwest. The polkas of track 16 are a perfect light-hearted cap to a wonderful collection of traditional music, as selected by our man McHugh. Almost as important as the actual recording is the “launch”. “The Master’s Choice” launch will be a concert set followed by a céilí (a dance) where many who have played with Martin or danced to his music over the years will join in. This celebration will occur in St. Paul, Minnesota at our amazing community hub for traditional music, dance and more—The Celtic Junction. Martin McHugh has given us a great gift many times over – Marty, this is our gift to you! Cheers!